Training is without doubt one of the most important responsibilities we have as a business. Starplus Services recognises the duty to provide its employees with whatever training is required so that they can carry out their job in a safe manner. This will ensure they are protected from hazards and that they do not cause anyone to be harmed by their activities. - Job specific training for all new employees or employee who transfers to other roles. 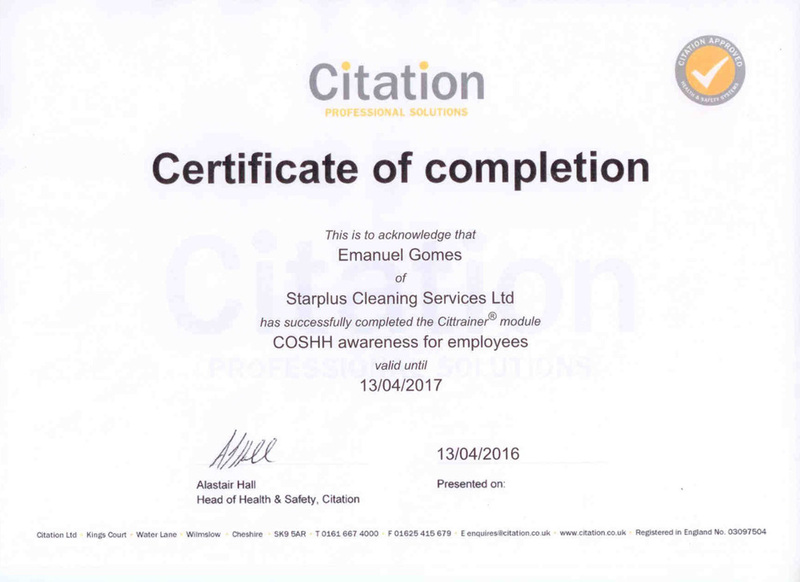 - Health and safety training for all employees that have been given specific tasks in the policy and to allow all employees to carry out their jobs safely. - Extra training and supervision will be provided for young people because of their immaturity and lack of experience. - Training will either be provided in house where appropriate or by an accredited training provider. - All training will be recorded and retained with the employee’s personal file as the employee will sign to confirm that they have received the training and understood it. Risk and CoSHH assessment training when applicable. Manual handling training as and when required. Use of Personal Protective Equipment (PPE) when issued. Use of Display Screen Equipment where necessary. Fire prevention and safe use of fire equipment. Any other training that may be relevant to their tasks or health and safety. We use Cittrainer® which is an online training tool which allows us to test our employees' knowledge of health and safety. A number of training courses are provided, each accompanied by a selection of test questions for your trainees to complete. These can be made available through Cittrainer, giving you visibility of your employees' progress in the areas they need to be up to speed with. If they pass the course the cittrainer will issue automatically a certificate for them.